The last and most important component of a well-built, long-lasting log cabin is its exterior finish. A quality exterior finish on a log cabin should serve to achieve multiple goals, including protection from weather and sunlight (UV), deterring insect, mold and fungus infestations, and providing a uniformly attractive color/stain of the wood grain. 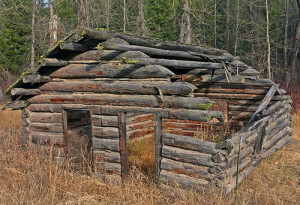 In frontier times, American log cabins were left exposed to the elements with perhaps a little white wash and a lot of prayer to keep the cabin from being destroyed by weather or insects. Today, a line of modern products can keep your log cabin looking as good as the day it was built for generations to come. The key is selecting the right products. a log cabin left to the elements. Like all residences, log cabins must stand up to a number of threats from Mother Nature. First and foremost is weather. Wind-driven moisture, be it rain, sleet, snow or even just high humidity, poses the biggest danger to a log cabin. The exterior profile of a log cabin is inherently more vulnerable to the elements than a modern home wrapped in vinyl siding. Water will destroy poorly treated logs fast. Logs permeated by water can warp and twist. Cracks can appear in less than a year. Inevitably rot will set in, threatening the structural integrity of the log cabin. Repairing (or worse, replacing) rotting logs is an expensive prospect that log cabin owners can avoid if they choose the proper exterior treatment. The sun can also deteriorate log cabins. Discoloration and fading are the frequent result of UV damage to log cabins. Sun damage, typically does not harm the structural integrity of the log cabin. But for most log cabin owners, the unsightly graying of logs is an unforgivable outcome that undermines the key component of a log cabin—the beauty of the logs themselves. 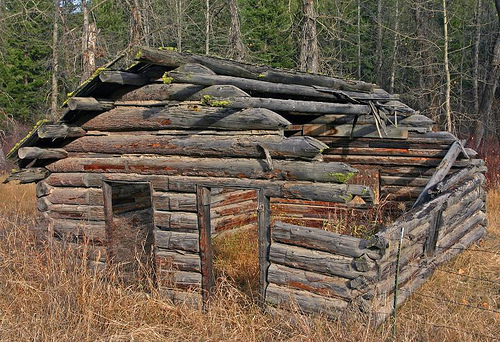 A wood-decaying fungus can also endanger log cabins. 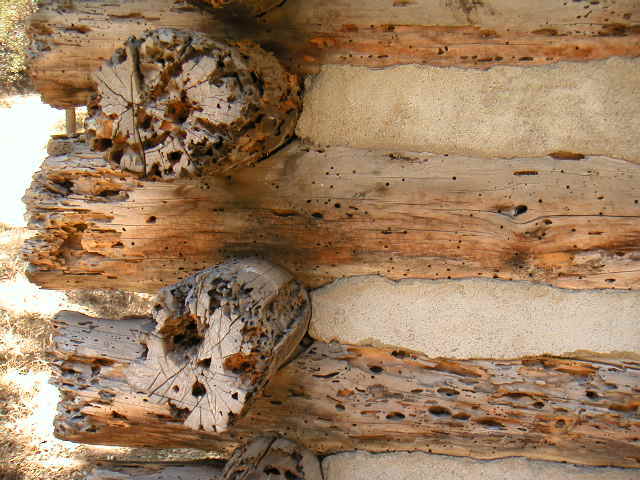 The U.S. Forest Service lists several pernicious fungal types that threaten log cabins, including soft-rot fungi, brown-rot fungi and white-rot fungi. Each of these decays wood, sometimes with little visible exterior signs of damage. 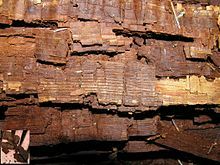 In other words, a fungal rot can destroy the wood from the inside out. Fungal rot starts with a breach in the log, be it a surface break in the log’s exterior coating or worse a crack in the log that allows water and fungal spores to get started. An example of brown rot fungus damage. The fact is, any untreated (or unfilled) opening in a log cabin, invites trouble. A crack in a log opens it to water permeation, which invites fungus and rot. Worse, a crack can invite a wood-boring insect infestation—carpenter ants, carpenter bees, wood boring beetles or even a full-blown termite colony. A termite damaged log cabin. Regrettably, some log cabin owners have chosen to have their log cabin painted with traditional exterior paint. This is (or should be) universally known as a grievous error by the owner or a conscious attempt to hide rot and/or other flaws in the log cabin’s exterior logs. Paint is never a good decision nor a sign of well-kept log cabin. Simply put, paint is not manufactured for use on log cabins. And the logs used in log cabins are not designed to accept paint. Steer clear of this option when building a log cabin or buying one from a previous owner. A latex stain is a water-based treatment that does not penetrate the log as deeply as other stain options. As such, it acts similarly to paint in its application and durability. Latex is an attractive choice for DIYers given its ease of application and clean up (soap and water). Latex is a water-based product, which means it typically will emit less fumes that can irritate eyes, breathing passages and skin. Fumes from these applications are technically called volatile organic compounds (VOCs) and raise some larger environmental concerns. The EPA defines VOCs as a “large group of organic chemicals that include any compound of carbon (excluding carbon monoxide, carbon dioxide, carbonic acid, metallic carbides or carbonates, and ammonium carbonate) and that participate in atmospheric photochemical reactions. VOCs are of interest in part because they contribute to ozone formation (U.S. EPA, 2003a).” They also pose some known risk to human health. Government regulation is trending against applications with high VOCs. Latex stains dry relatively quick, allowing a recoat in an as little as an hour or so. The per-gallon cost is between $25 and $40. The durability of latex stain, however, is suspect. After two-years (up to five, at best), depending on weather conditions and sun exposure, additional applications are needed. “Latex-base semitransparent stains are film-forming finishes and will not perform like true penetrating stains,” according to the U.S. Forest Service. Latex exterior stains are available in opaque and semi-transparent. The more transparent the coating the less protection against UV fading is provided. So the trade-off is between visual attractiveness and durability. An opaque application hides the grain of the wood but protects longer. However, both options are prone to flaking over time. Latex stains are improving, mostly due to the increasing emphasis on limiting VOC content, which is spurring rapid research and development of these stains. Still, they lag in quality when compared to traditional oil-based products. Acrylic stains range in price up to about $70 per gallon and can last up to 4-5 years. Green River Cabins has co-developed a lower-cost acrylic stain that retails for just $40 per gallon. Produced exclusively by Carolina Solvents, this oil-based acrylic includes superior UV protection and additives that repel mildew, fungus and insects, including termites. Technically known as TG 10, this low-VOC product retails exclusively to Green River Cabin customers. The last (and best) option for preserving a log cabin exterior is an oil-based stain. Nothing matches its strength, durability and attractiveness. As its name suggests, these stains are made with oil, not water. They key ingredient is linseed oil, which penetrates the wood to form a hardened exterior that blocks moisture, while enhancing the appearance of the wood grain. Additional ingredients are added to ward off mildew, fungus and insects. A UV protector is also included to deter graying. Oil stains typically cost more up front than other finishes, but that cost difference narrows when the customer considers the long-term value. Oils stains cost our customers about $85 per gallon, but deliver between seven and ten years of protection, depending on sunlight exposure. Low VOC stains are now available that deliver the benefits of oil stains with a dramatic reduction in environmental and health risks. These stains are also mixed to include anti-fungal and insect repellent properties to further enhance their durability. No matter what exterior application is chosen, it is imperative that the logs be dry and clean of any mold, mildew, sap, dust or any other surface debris that can interfere with the bond between the log and the finish. Just as important, it is always a good idea to apply two coats of finish to ensure a uniform and strong application. Additional coats are an option and typically darken the visible grain. Consult with your builder and the finish manufacturer to determine what application is best for the color and sheen you desire.